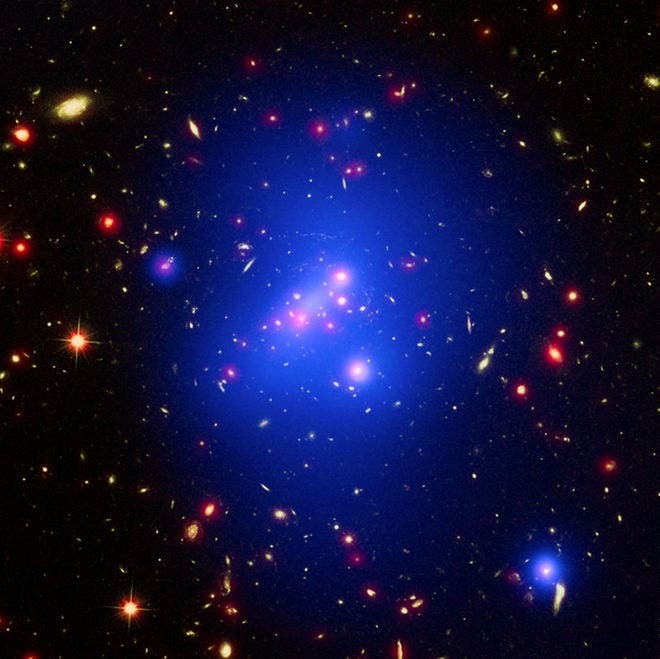 In late 2015, astronomers at MIT, the University of Missouri, the University of Florida, and elsewhere detected a massive, sprawling, churning galaxy cluster that formed only 3.8 billion years after the Big Bang. Located 10 billion light years from Earth and potentially comprising thousands of individual galaxies, the megastructure is about 250 trillion times more massive than the sun, or 1,000 times more massive than the Milky Way galaxy. 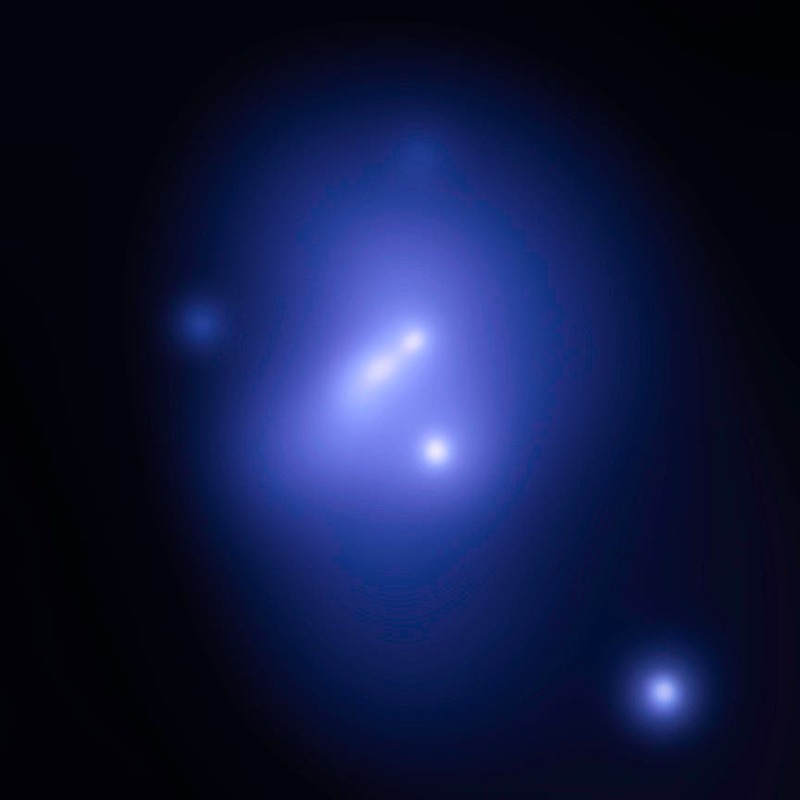 The cluster, named IDCS J1426.5+3508 (or IDCS 1426) shown below, is the most massive cluster of galaxies yet discovered in the first 4 billion years after the Big Bang. IDCS 1426 appears to be undergoing a substantial amount of upheaval: The researchers observed a bright knot of X-rays, slightly off-center in the cluster, indicating that the cluster’s core may have shifted some hundred thousand light years from its center. The scientists surmise that the core may have been dislodged from a violent collision with another massive galaxy cluster, causing the gas within the cluster to slosh around, like wine in a glass that has been suddenly moved. McDonald says such a collision may explain how IDCS 1426 formed so quickly in the early universe, at a time when individual galaxies were only beginning to take shape. McDonald and his colleagues presented their results this week at the 227th American Astronomical Society meeting in Kissimmee, Florida. Their findings will also be published in The Astrophysical Journal. However, finding galaxy clusters that are farther away in space — and further back in time — is a difficult and uncertain exercise. In 2012, scientists using NASA’s Spitzer Space Telescope first detected signs of IDCS 1426 and made some initial estimates of its mass. To get a more precise estimate of the galaxy cluster’s mass, McDonald and his colleagues used data from several of NASA’s Great Observatories: the Hubble Space Telescope, the Keck Observatory, and the Chandra X-ray Observatory. “We were basically using three completely different methods to weigh this cluster,” McDonald explains.